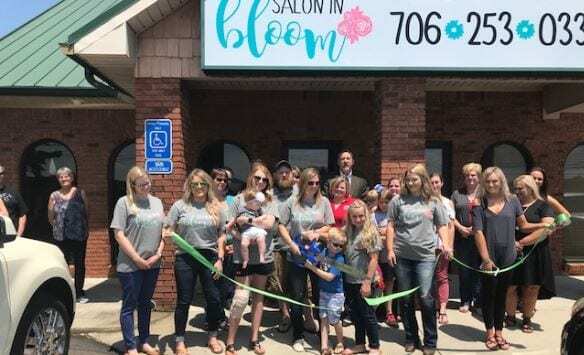 JASPER, Ga. – The Pickens County Chamber of Commerce recently had a ribbon cutting at Salon in Bloom located at 3850 Camp Road in Jasper, conveniently located a short distance from the Bargain Barn. As you walk in the door, the first stylist you’ll see is the owner herself, Melanie Eggley. Her dream and passion of doing hair truly shines through in every style she creates. Melanie specializes in cuts, color, and balayage, as well as special occasion makeup and updos. She is also certified in extensions and Brazilian blowouts. Melanie is very proud of her highly skilled staff, which includes Emily Martin, Hannah Easterwood, and Heather Hilliard Davis. Emily is passionate about her work and has been in the beauty industry since 2014. Her specialties are updos, makeup, balayage, highlights, color, cuts, and she is also certified in Brazilian blowouts. A native of Jasper, Hannah Easterwood loves everything about the little mountain town we call home. She specializes in wedding hair and makeup, and already has over 30 ceremonies booked this year. In the salon, Hannah offers a wide range of services including balayage, standard highlights and lowlights, women’s haircuts, extensions, and facial waxing. Working in the salon industry since 2008, Heather Hilliard Davis was most recently a stylist in Cherokee County before bringing her experience to Jasper. Her starting point with customers is to first evaluate the health of their hair and to keep it as a priority while striving to achieve the desired results. Heather specializes in highlighting, lowlighting, balayage, color, women’s cuts, extensions, and more. For more information about Salon in Bloom and many other Pickens County Chamber of Commerce member businesses, please visit the website at www.pickenschamber.com or call 706-692-5600 from 9 am to 5 pm Monday through Friday.